Description: Ringo is a distinctive range of toys made by Touchango K9. 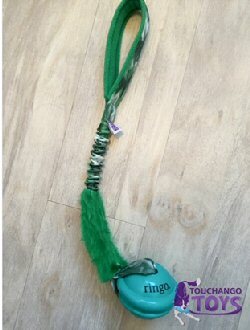 It consists of a Planet Dog Ringo ball on bungee handle and comes in four variations - each with a gorgeous green swirled patterned webbing and a strong yet flexible bungee handle to reduce concussive forces between you and your dog during vigorous play. Touchango Toys are designed for interactive play between you and your dog. I have six dogs and each dog has their own toys. I have to admit that I like my dogs to be 'colour co-ordinated.' I like them to have matching leads, harnesses, coats and, of course, toys, too. I use the Ringo toy exclusively with my two year old Border Collie Amp as a training reward, though I am sure all the rest would engage with it, apart from Wish my Sheltie who prefers food. I’m really pleased with this bungee toy. Amp really does target the ball more than other toys he has had, the Ringo is still in good condition even after some real hard tugging. Because the handle is soft, it is very comfortable for me to hold. 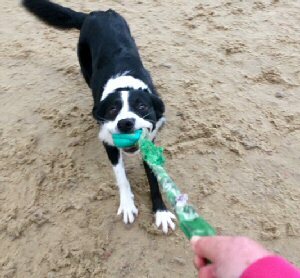 The bungee acts like a spring, there is far less impact on the dog and myself whilst engaging in a good game of tug, which makes it a far more enjoyable experience for us both. Being softer than other balls, Amp can squish it when he chomps down on it, but is it has enough weight to throw it a good distance when training alone. Nothing, but would love to see same toy in other colours as the Ringo Ball is currently only available in green. Perfect. The Ringo has lasted much longer than previous similar toys. I have a good collection of Touchango Toys and love design and bright colours. 10/10 because it really suits me and my dog. Admittedly, it is the higher end of the price range for a toy but, having said that, it is lasting longer than any others I’ve tried. With this in mind, yes. I recommend Touchango Toys to all my clients at club and friends. From small to large breeds, there is a toy to suit from Touchango K9 with a great colour selection, lots of different designs, a vast variety to choose from, extremely well made. Happy dogs, happy owner. Lisa Jordan has been involved in dog training for 30+ years. She started in Agility around 1987 with a lovely Springer Spaniel and a GSD which was then 'her' breed of choice. She then fell in love with Belgian Shepherds. Now she has two - both retired one 14 ½ year old Inca (G6) and 11 year old Meme (G6). She has promised herself that she'll always have a BSD. She also has a 10 year old Sheltie Wish (G7), 7 year old WSD Dec (G7), 2 year old BC Amp (G3) 2years and 1 year old BC Switch. Lisa has her own club called K.i.s Dog Training, teaching groups from Young Pups Life Skills, Foundations and Hoopers as well as Agility. She invites many guest trainers mainly over the winter period. She lives in Biggin Hill, Kent.